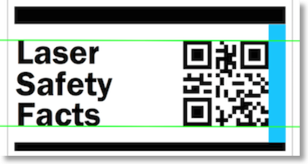 A QR code is on the Laser Safety Facts label, and a QR or Data Matrix (DM) code is also on the laser itself. The code contains a webpage URL such as “LSF.ME/3R” or “LSF.ME/HH_445-2500_15_CW_4_WCK01”. For any given laser model, each code -- on the Laser Safety Facts label, and on a label attached to the laser -- should encode the same URL address. Scanning the code with a smartphone or tablet instantly takes a person to a webpage with important safety information for that laser class, and possibly even for that exact laser model. QR and Data Matrix codes for: LSF.ME/3R. Both are 120 pixels wide. Note that the Data Matrix code is more compact -- about half the vertical height of the QR Code. Also, Data Matrix codes use a smaller border (Quiet Zone) than QR codes; this also saves space. 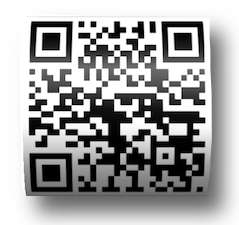 There are currently four ways to encode the webpage URL that ends up in the QR or DM code. All of these methods use the all-caps short URL “LSF.ME”. As explained below, this allows for a more compact QR or DM code, compared to using a mixed-case long URL such as “www.LaserSafetyFacts.com”. A 1-2 character Class code: This is for a generic page describing the hazards of a Class. For example, “LSF.ME/2” goes to a page describing Class 2 safety, while “LSF.ME/3R” goes to a page about Class 3R safety. There are four such pages, for Classes 2, 3R, 3B and 4. Anyone can encode a QR or DM code with one of these four addresses, since the corresponding webpages already exist. Custom Class 4 codes: The generic Class 4 page (LSF.ME/4) is for single-wavelength lasers between 0.5 and 2 watts, with a 1 mrad divergence. For other Class 4 lasers with higher powers and/or other divergences, we can create custom pages. These are described in more detail on the About Laser Safety Facts page. The square QR code is more familiar and can be scanned faster than an equivalent Data Matrix code. However, it has a problem when put onto a cylindrical object such as a laser pointer. If a QR code is less than 1/3 the cylinder diameter, it can be successfully scanned. But if it is any larger, the curvature distorts the QR code so that it is difficult or impossible to scan. Even a slight curvature such as this is too much for most smartphone and tablet apps to reliably scan. For example, on a laser that is 1 inch in diameter, the QR code would have to be 1/3 inch or less in height. This is already pretty small -- on a fairly large laser. On a QR or Data Matrix code, the longer the URL that is encoded, the smaller the individual data blocks get. This is why we use the short URL “LSF.ME” instead of “LASERSAFETYFACTS.COM”. In the QR codes below, the image on the right would need to be physically larger in order for a smartphone or tablet camera to reliably scan the smaller data blocks. That is also why we use ALL CAPS for the URL when creating a code. Even just switching between capital and lower-case letters can add data to the QR or DM code causing it to use more data blocks. Both QR and Data Matrix codes require “Quiet Zone” borders around the black blocks. For QR codes, the Quiet Zone is a minimum of four blocks wide. For Data Matrix codes, the Quiet Zone is a minimum of one block wide, although two are recommended. All LaserSafetyFacts-designed labels incorporate these Quiet Zones. 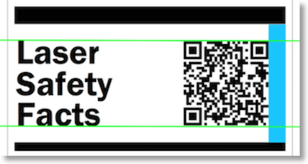 The stacked words “Laser Safety Facts” and the QR code are a visual “logo” that help define the Laser Safety Facts label. For consistency, the QR code’s dots are the same height as the words. The right side of the QR code’s Quiet Zone (e.g., the outer border) is even with the end of the black bars. No matter how sparse or dense the QR code is, the black area is always even with the top and bottom of the text (green lines), and the Quiet Zone’s outer border (blue rectangle) is even with the black bars. The best colors for QR and Data Matrix codes are black blocks on a white background. This provides the highest contrast for readers, so it is the standard for LaserSafetyFacts labels. For labels put on a laser, it is permissible to invert the colors. This may look better on a dark-colored laser. However, be aware that some code reading apps may not be able to read inverted colors.